I haven’t had home-made ravioli in years! Making them is just so easy, so there’s really no excuse! My mother lives with us in the Carolina’s during the cold, harsh winters of Iowa . . . and with her this year, she brought some frozen Swiss Chard grown in my cousin, Jackie’s garden of perfection! If you could only see what grows in that garden of hers every year . . . she totally puts mine to shame! So ravioli is on my ‘must-make’ list of recipes this winter. For our Super Bowl spread that is! Beginning with a discussion of making “easy, simple-to-put-toegether, small appetizers”, we somehow ended up deciding that we’re going to have home-made ravioli . 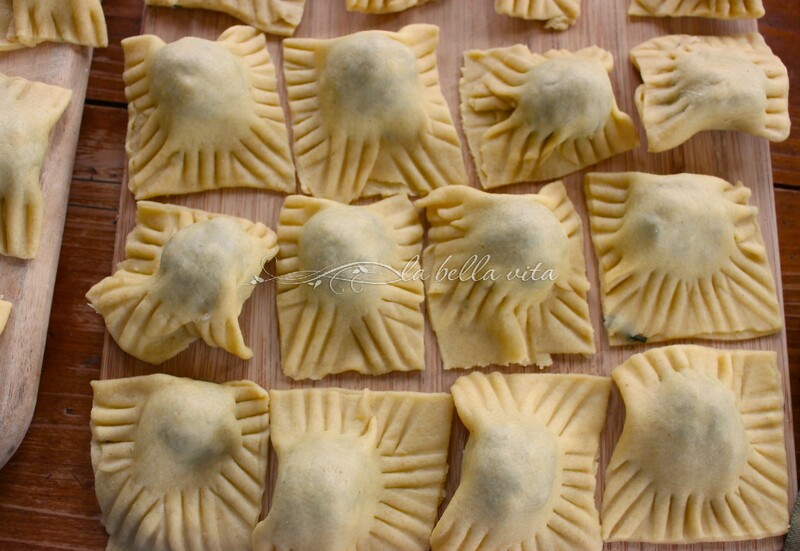 . .
Home-made Ravioli for the SUPER BOWL? Who else, but my mother, would decide to go that far? But hey, who’s complaining? Not me! This is my favorite filled pasta! 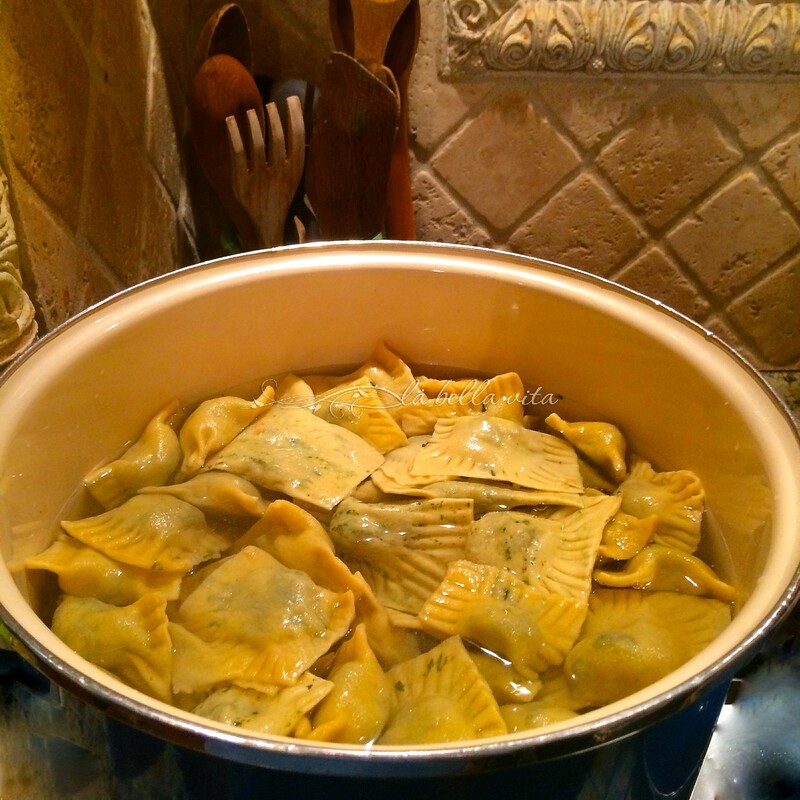 And I don’t have to wait for a holiday to enjoy them as we always wait for Tortellini in Brodo for Thanksgiving, Christmas, and Easter! Further down, you’ll find the vegetarian filling that we use . . . it’s swiss chard-based. 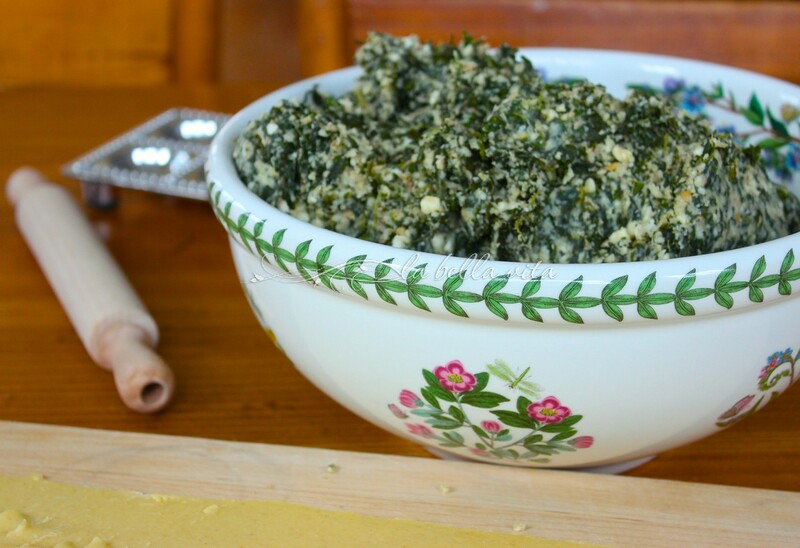 Yes, you can use spinach, but we’ve grown up using garden-fresh swiss chard. So change it out using spinach, or however you please; after all, you need to please YOUR palate and not mine. 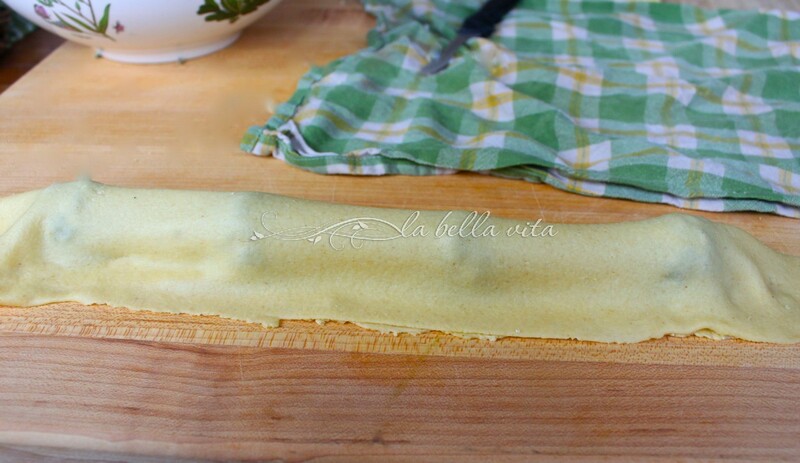 After making the filling ahead of time, prepare the fresh pasta. Let it rest awhile and then roll it out into nice long sheets. My mother has fallen in love with the Kitchen Aid Mixer pasta roller attachment (it’s hers, not mine, at nearly $300). I still use the hand-cranked roller! Here is a professional video tutorial using the Atlas Pasta Roller (the #1 selling pasta rolling machine). I love this; very easy to follow, with a little jazzy music and totally educational for those wanting to learn how to make home-made pasta from scratch. 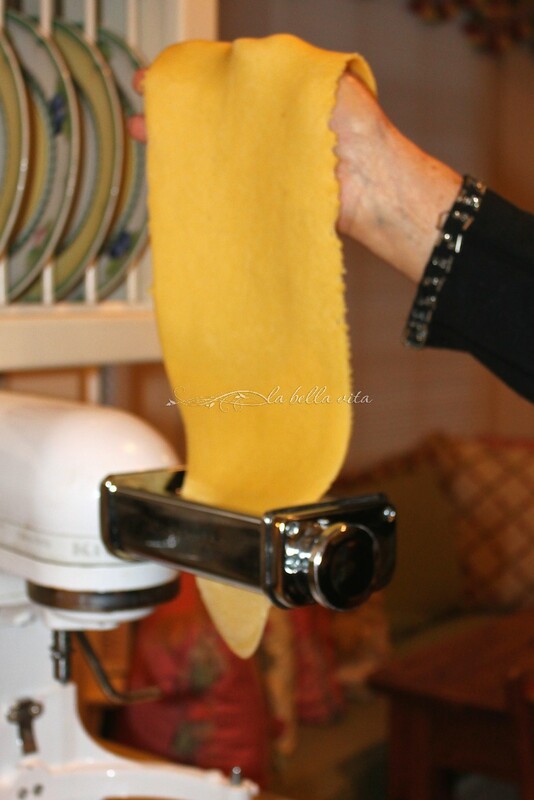 Then I will show you how to use the Kitchen Aid pasta attachment. As you can see below, take a damp-dry towel and COVER the pasta that you’re not working on at the moment to prevent it from becoming dry and un-workable. 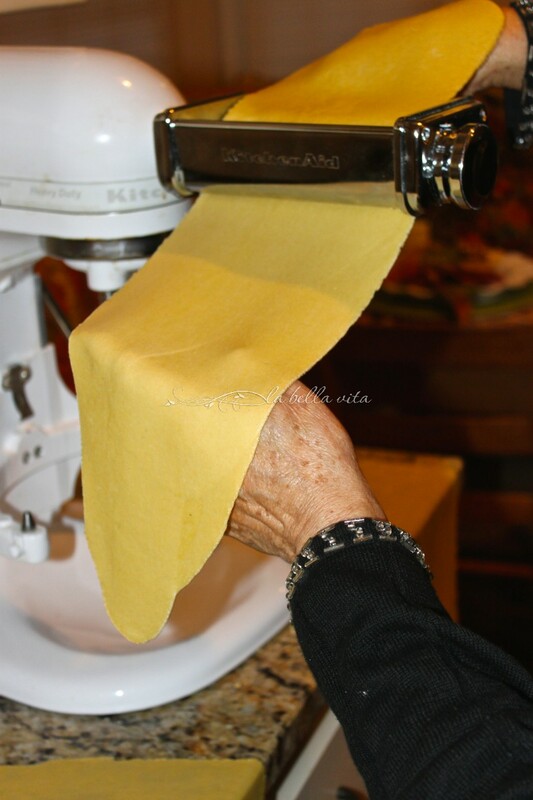 When too dry, the pasta will break open as you’re making ravioli (or any stuffed pasta such as tortellini) and it will wrip and tear, leaving ‘holes’ that the filling will fall out of and also break during cooking. Trust me, you don’t want that to happen! 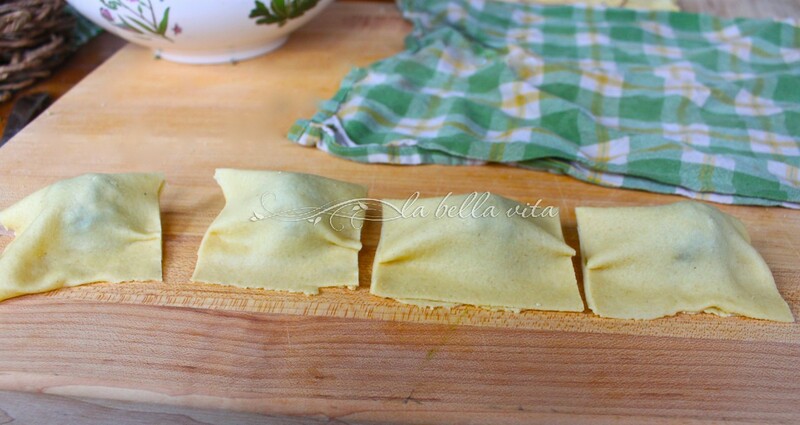 lay out the ravioli on wooden boards to dry if you are going to freeze them. . . however if you are having them for your current meal, they can go straight into the boiling pot of water right then and there. 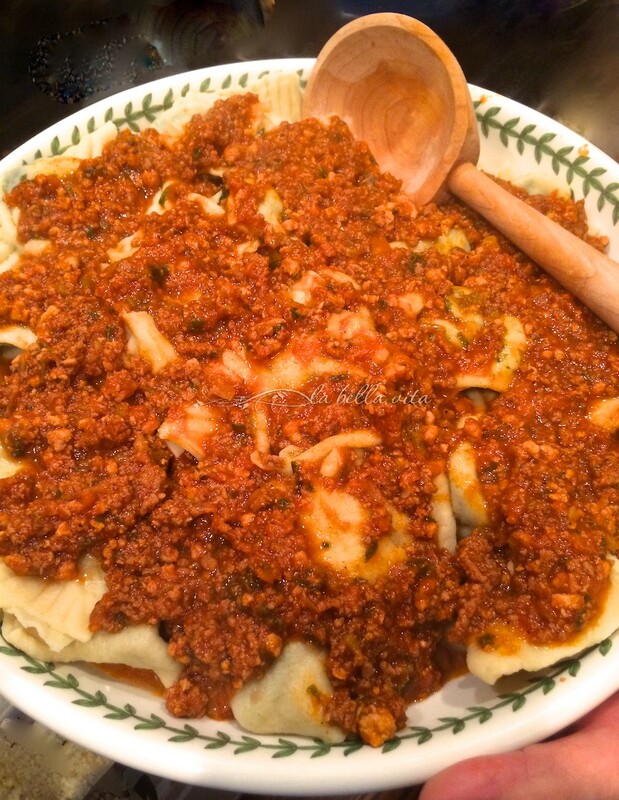 A wonderful serving of Ravioli with Bolognese — about 4 or 5 with the sauce is very filling! 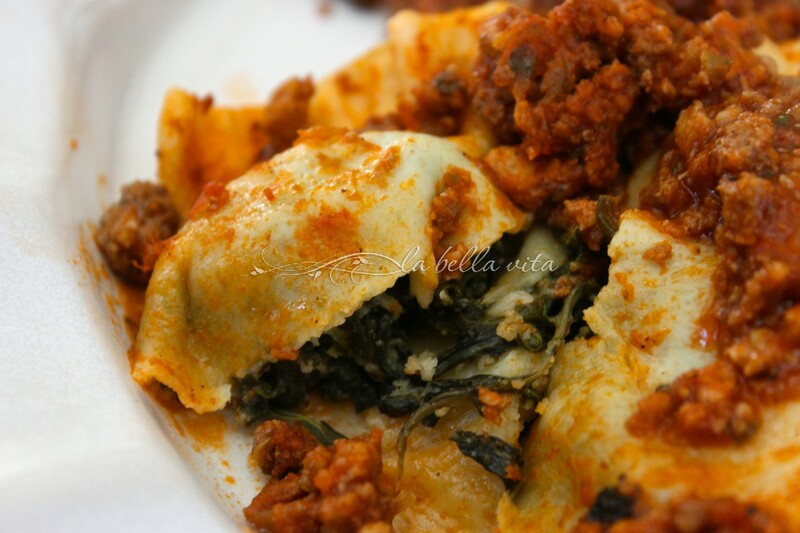 Delicious Swiss Chard, Pecorino, Parmigiana, and Asiago Breadcrumb filling peaking out of the pockets of pasta! Beautiful pasta bundles of love! Mmmmm! If you need a great cookbook on making fresh pasta, gnocchi, or risotto, here’s my favorite book available. And here’s the pasta recipe for you! 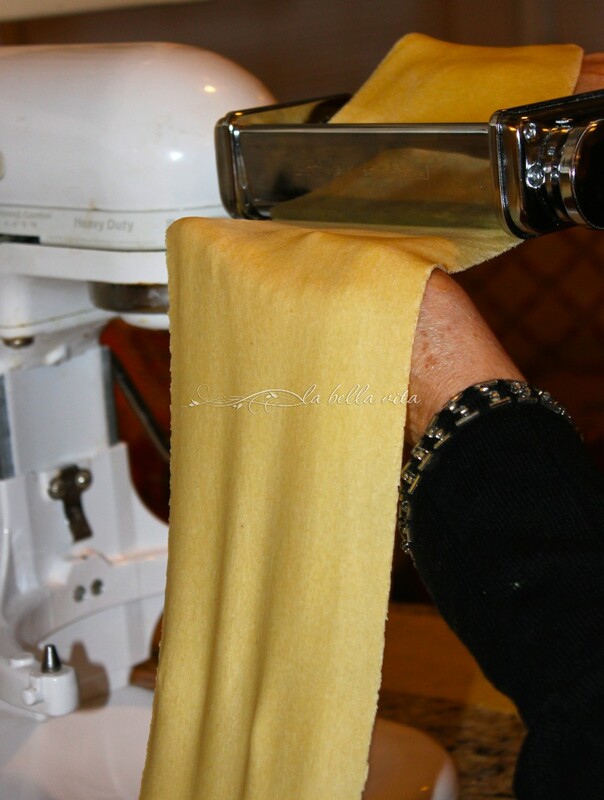 Pasta dough that Roz uses for every pasta shape! You can mix this the old-fashioned way by making a “bowl” of flour on a wooden block, placing the wet ingredients in the center of the ‘flour bowl’ and gently add the flour in with a fork until completely mixed, OR you can mix the dough in a food processor until it has the consistency of cornmeal. 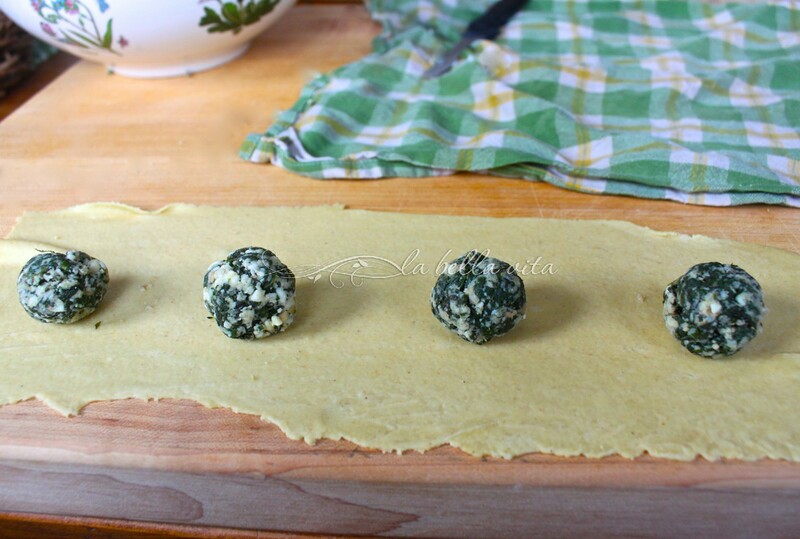 wow…Homemade pasta with garden fresh Swiss chard filling…that’s something you don’t see often. Pass the spoon over and I want to dig in that bowl of filling! YUM! Oh thank you Angie, this pasta recipe is nothing as amazing and creative as your wonderful recipes that I LOVE, LOVE, LOVE! Great post Roz and my mouth is watering. 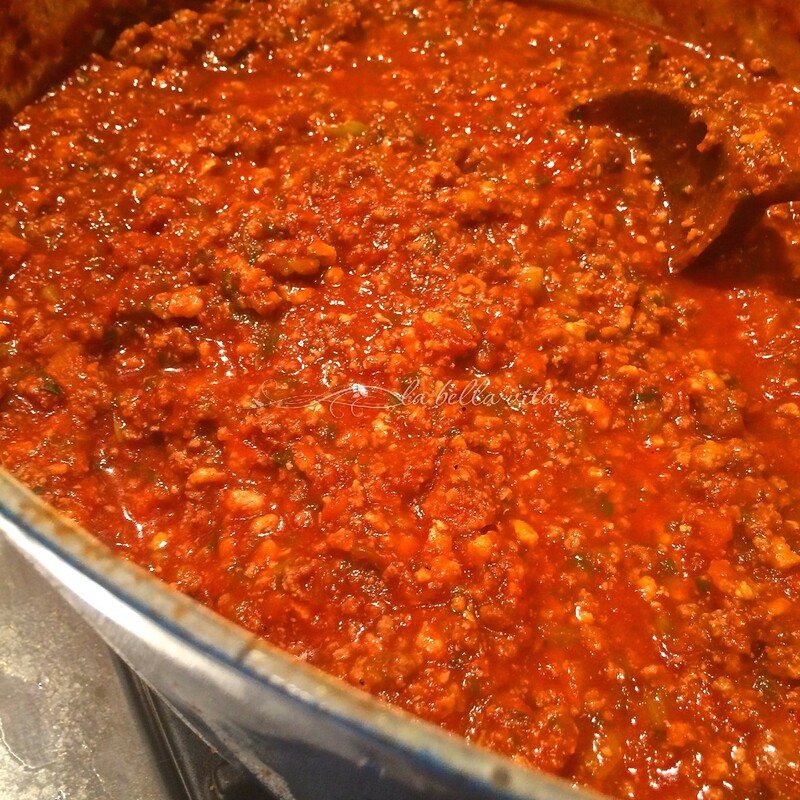 We’re only four hours away if your mom would like to get away from you for a little while and teach us how to make the real deal Italian. 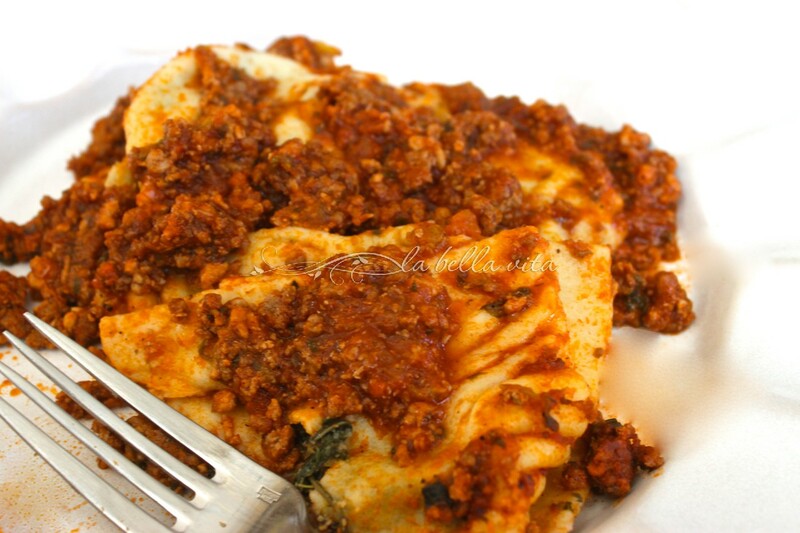 I’ll be happy to give you a personal cooking lesson on preparing pasta and ravioli Larry! Just let me know when you’re free and I’ll help you! Happy Easter to you and Bev! You’re so sweet Katherine, I will try harder to share more on your Monday and Thursday blog hop days! I’m just so busy until summer arrives (I teach until the middle of May) . . . students first until that time. Barely able to get one post written per week. Hope you understand! 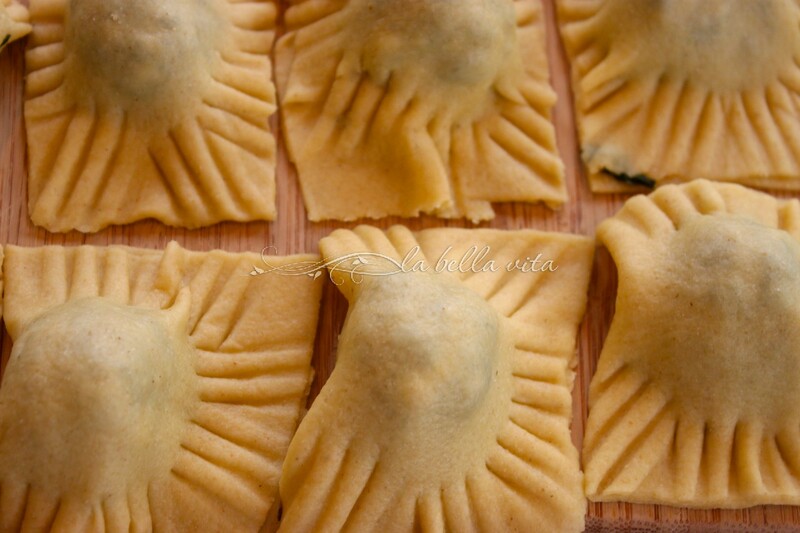 The ravioli are lovely and look delicious. That sauce? Oh my goodness!! A tip of the white toque to your mother. Oh thank you Bonnie! You’re so sweet! My mom is a great teacher that I’m happy to pass on the techniques and know-how of making pasta! No wonder you’re such a great cook with a mother like that! What a delightful tutorial and recipe and I love seeing your mother’s hands on the pasta 🙂 I’m ready for a dish of that! Awe, you are just so sweet and kind, Susan. I’m nothing compared to your culinary skills! Please keep teaching me! Mmm. Nothing beats homemade ravioli. I haven’t made them in ages. May have to put them on the rotation soon. Hey Arlene, I hear you . . . home-made ravioli aren’t on my regular recipes to make either. I need to get in gear and make them more often! Thank you Betty! Can’t wait to read your latest recipes! It’s busy, busy, busy and so hard to blog all of the time! I am SO glad you posted this. 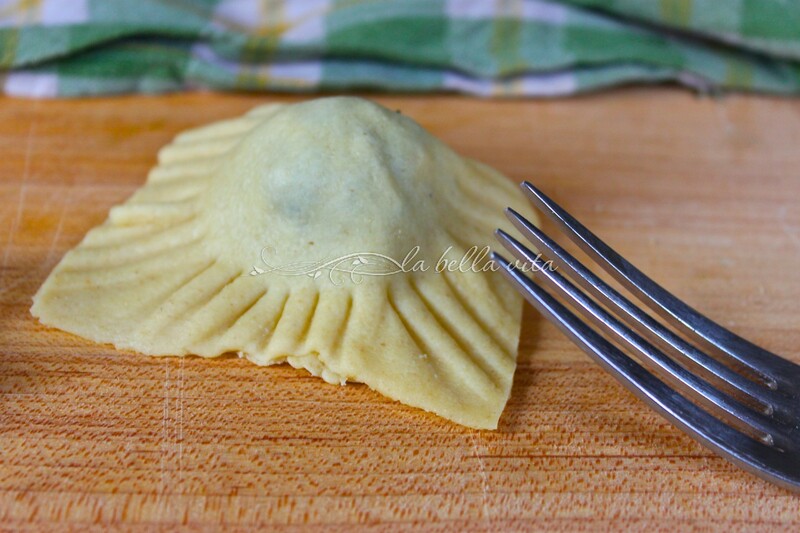 Homemade ravioli has been on my bucket list for YEARS. I even have the kitchenaid attachment, and have never used it. My family would prefer the chard filling over spinach. It sounds beyond delicious. Thank you for the inspiration! Hey Mindy, let me know if I can help you in any way in preparing home-made ravioli and/or pasta in your kitchen! My pleasure and honor to answer any questions that you may have! Oh, I’d like to be at your dinner table, Roz! The ravioli looks fabulous! It has always intimidated me but after seeing this, I should give it a go. Sounds like you had a great teacher, and it’s good that she’s escaping the winter weather! It’s bitter cold and windy here today! And I’d love to be at your dinner table too, Pam! Love the summer sausage recipe! Mouthwatering! Dear Roz, I love that your mom’s hands in the pictures making the ravioli. It is so nice that you have each other and cook together. That is what it is all about. This is such a beautiful recipe and the pictures are wonderful. Thank you, Catherine, so much for you wonderful comment about my mother and me making pasta/ravioli together: you are so right in saying that ‘this is what it is all about’ —- love and amore’! 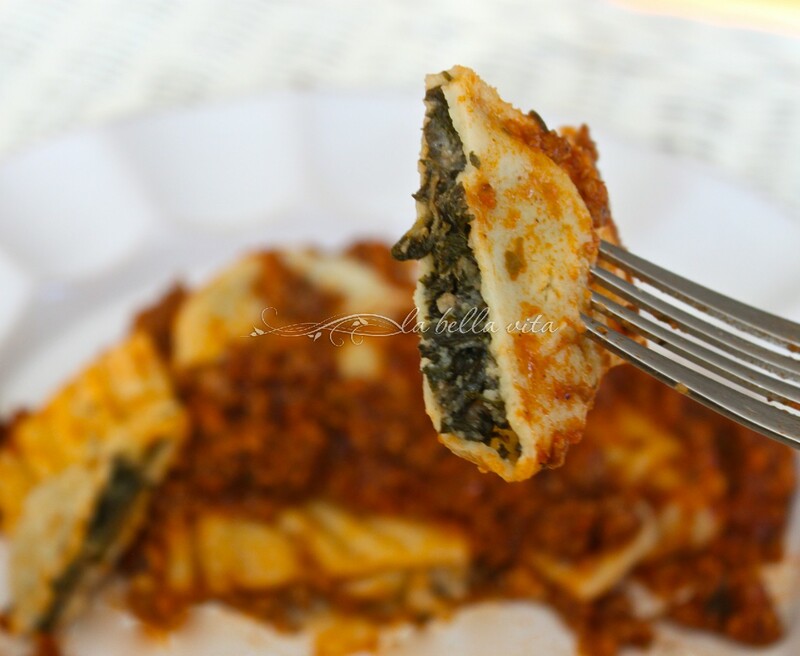 great post Roz, ravioli looks wonderful ! Have a lovely Valentine’s day, un abbraccio ! Grazie Chiara! I appreciate your beautiful friendship and visit with kind comment! God bless your mom. I love hearing about multigenerational cooking like this. I need to get busy making some ravioli soon. I feel the same way about your posts in which you share your cooking/culinary/Italian heritage experiences with your father. Family is the best! Thank you for your kind comment and visit! I really loved reading this post, Roz! What a wonderful thing to be able to cook with your mom. 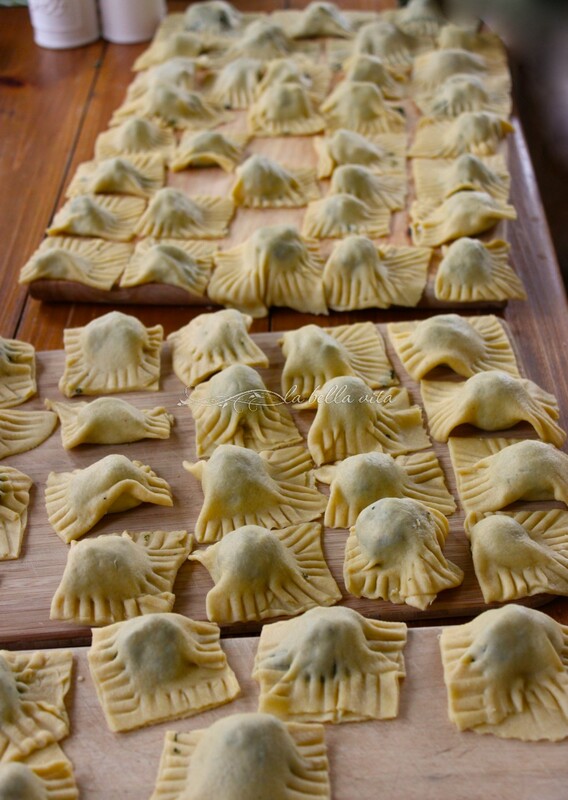 I had no idea how ravioli was made – so interesting! You make it look so easy, but I have to say I am a little intimidated by the thought of making it. Maybe some day I will get up the nerve to make my own pasta! Thanks for sharing your wonderful family stories and all the pictures. Beautiful! Hi Shari, Yes, cooking with our mothers is indeed very special and memorable! Hi, I am having trouble finding some of your recipes, especially the Pasta Dough for the Ravioli, the Filling Recipe and your Bolognaise recipe. Not sure what I am doing wrong or if I am going to the wrong section, but I would like to make these recipes. Your recipes look amazing! I have the pasta dough recipe posted. It is the one and only pasta dough that I use in every recipe. It’s perfect. When I feel better, I will hunt down the other recipes and send them to you.